Majority owner Rob Kauffman (right) is reportedly ready to leave Michael Waltrip Racing. SportsBusiness Daily reported Wednesday that Michael Waltrip Racing principal owner Rob Kauffman is moving in on the purchase of team co-owner Felix Sabates’ stake in Chip Ganassi Racing, according to multiple industry sources. A completion of the sale would force Kauffman, who co-owns MWR with company founder and FOX Sports TV personality Michael Waltrip, to drop his affiliation with MWR. Kauffman, the founder of Fortress Investment Group, has been with MWR for eight years. The former investment banker would assume Sabates’ minority stake in the Ganassi team, while the Ganassi team’s principal owner, Chip Ganassi, would continue to retain majority control, according to what sources told SportsBusiness Daily. It is unclear if Sabates would keep a small stake to retain his affiliation with the team or if he would drop the affiliation entirely. MWR currently fields the Sprint Cup Series teams of drivers Clint Bowyer and David Ragan, the latter of whom took over MWR’s No. 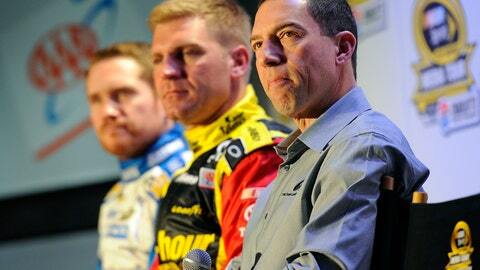 55 Toyota in May following a substitute role at Joe Gibbs Racing. Sources told SportsBusiness Daily that Kauffman would move Bowyer’s No. 15 team with him to Ganassi. What all this would mean for the future of MWR and Ragan is uncertain. Asked by FOXSports.com last weekend at Indianapolis Motor Speedway to address speculation that MWR might switch from Toyota to Chevrolet next season, Kauffman declined comment. David Wilson, president and general manager of TRD, U.S.A., Toyota’s racing division, said earlier this week that MWR has yet to confirm which manufacturer it will align with for the 2016 Sprint Cup Series season. Several of MWR’s current sponsors have also yet to commit long-term. MWR has been with Toyota since 2007, the year that the Japanese manufacturer and the organization entered the Sprint Cup Series together.